The Rebel Sweetheart. 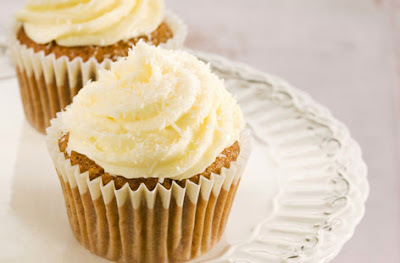 : Foodie Goodie | Carrot Cupcakes. Who's in the mood for carrot cupcakes? I am! I even dreamt of them last night, haha! 1. Preheat the oven to 350 F. Line 12 standard muffin cups with paper cupcake liners. 2. Sift together the flours, baking soda, salt, cinnamon and nutmeg. 3. In a large stand mixer with the paddle attachment, combine the brown sugar, oil and eggs until well combined. 4. Add the carrots and vanilla. 5. Add the dry ingredients and mix until combined. 6. Stir in 1/4 cup of the chopped walnuts. 7. Divide the batter among the muffin cups. Bake until a toothpick comes out clean, about 20 minutes. Transfer to a wire rack to cool completely. 8. With an electric mixer, beat together the cream cheese, confectioners' sugar and orange juice until smooth and creamy. 9. Frost the cooled cupcakes and sprinkle with the shredded coconut. I haven't had a pieceof carrot cake in a LONG time--and I do love it. From that recipe above I doubt I would attempt to bake one-but I probably will go out and get a slice or two! those cupcakes are looking real yummy.will definitely give it a try. You made me really want to get that oven I've been eyeing for. The cupcake looks yummy. I love carrot cake and for some unknown reason I have never made one. I am thinking that I should do this for Thanksgiving this year. These sound so delicious! I can't wait to try the recipe. I love carrot cake. Looks yummy... I love carrot cake in any shape and form. I just don't like the part where I have to make it myself, lol! I remember when I had my baking class that it is the carrot cake I made for my finals.. I chose it because I love the cream cheese frosting. wahahaha! this looks good! i have a sweet tooth you just made me crave! This look so yummy. I have this bookmarked and will be sure to be a hit at my upcoming Thanksgiving parties!! I like Carrot cakes because their sweetness level is not overpowering and taste just right. I love Carrot Cake. You should try adding some pineapple, mas yummy! Not a fan of carrots in my desserts :( But I'll have my friends try this recipe, thanks for sharing! omg, if i could gain gain weight with every bite of these delicious things i'd eat them everyday... looks so yum!! oooh, yum! must try this! soon!